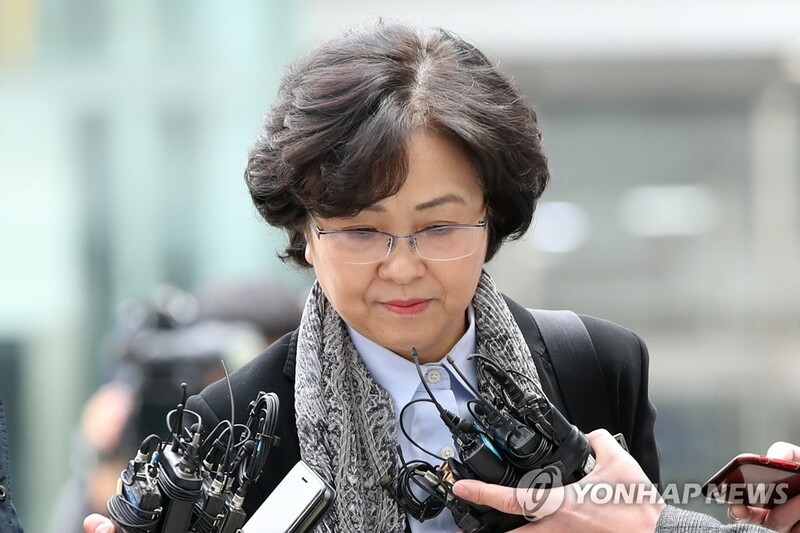 SEOUL, March 25 (Yonhap) -- A Seoul court held a hearing Monday to decide whether to issue an arrest warrant for a former environment minister on suspicions that she abused her power by forcing those considered critical of the incumbent administration to step down from their government posts. Kim Eun-kyung, who headed the Ministry of Environment from 2017-18, stands accused of pressuring several heads of public institutions affiliated with the ministry to step down and disadvantaging one of them for not complying with the demand. She appeared at the Seoul Eastern District Court for the 10:30 a.m. hearing. "I will do my best to explain to the court and will wait for the judge's decision," she told reporters, refusing to take any more questions. If the court issues the warrant, Kim will be the first former Cabinet member under the incumbent liberal Moon Jae-in government to face trial on criminal charges. The allegations have drawn attention as some former top officials from the previous Park Geun-hye government are standing trial on similar charges. Kim Ki-choon, Park's former chief of staff, and former Culture Minister Cho Yoon-sun have been indicted for keeping a "blacklist" of artists and TV celebrities to freeze them out of the mainstream media because of their left-leaning tendencies. The presidential office Cheong Wa Dae has defended former minister Kim, insisting that decisions on who should be, or should not be, appointed as top officials is well within the power of a minister. The former minister is accused of having sought to replace those appointed under the former conservative administration with appointees of her own choice without going through a due selection process. Kim is also alleged to have ordered an inspection into the official who refused to quit his job at the Korea Environment Corp.
Kim has undergone a closed-door interrogation over the allegations, which she has flatly denied. The probe into Kim began after a complaint was filed by the main opposition Liberty Korea Party, which was the previous ruling party.